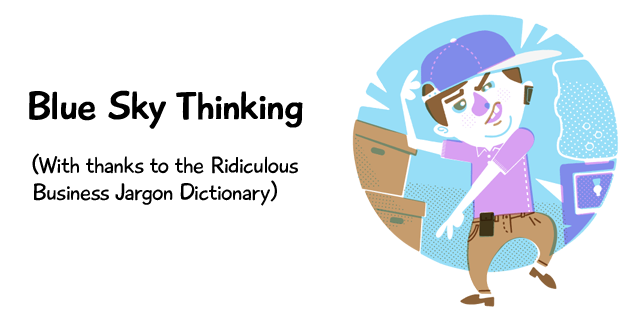 The Office Life - The most cringe-worthy business jargon, delivered fresh. I’m not going to sugarcoat it. Business people, you sound ridiculous. 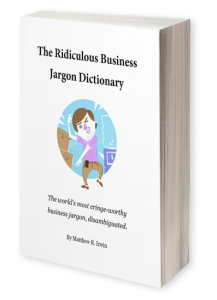 The Ridiculous Business Jargon Dictionary was started in 2005 as a place to collect and document the outrageous expressions that have become so common in the working world. Since launching, it has grown to become the largest collection of business jargon online. The corporate world is inventing terrible new jargon faster than we can document it, but your support will help us continue this important work. Pick up a copy today, supercheap! So you suddenly find yourself with a burning attraction for that new addition to the Receivables department. You’re thinking, “Where’s the harm in asking her out? I’m sure we could keep things totally professional.” Well before you go down that road, there are definitely some things to keep in mind. Assuming she’s into it (watch that sexual harassment), this could either be a great match or the biggest mistake of your career. The reality of the modern office is that people are working more hours and getting married later in life. 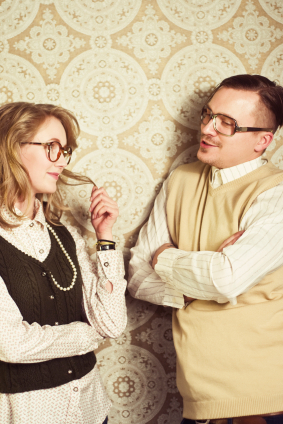 This means that there are probably more singles of dating age at your office now than ever before. With more time spent at work, people also tend form social networks that get together outside the office walls. This situation creates an ideal setting for the full range of human attraction from copy room hook-ups, to trade show infidelity, to long term dating. Many employees are under the impression that their right to personal privacy extends to the workplace. These people may be surprised at just how widespread employee monitoring truly is. And when it comes to employee privacy, the innocent looking machine on your desk is the single greatest threat. A survey from amanet.org indicates that 76% of employers monitor websites visited, 50% review computer files, and 55% store and review emails. The same article claims that about one quarter of companies have fired someone for improperly using the Internet. The reality is that current laws do not prevent your employer from using various methods of employee monitoring – even without your knowledge. Whenever employers’ actions have been challenged in U.S. courts, the law has almost always found in favour of the company. The general consensus is that the organization not only owns all of the equipment used to complete the work, but effectively the 8+ hours of time you spend there each day. Any kind of computer monitoring is complex, costly, and can impact company morale; so why are organizations eager to do it? In the information age, a single mouse click – whether intentional or not – can cost a company millions. We also live at a time when lawsuits from things such as sexual harassment, liability, or unethical activity can be equally as damaging. While these may be extreme cases, the combination of the incredible convenience and relative permanence of electronic communication has made it goldmine for corporate lawyers. So what can you do to resist this kind of privacy invasion at work? The first step, of course, is to find out what your company will admit to. They aren’t actually required to disclose most types of monitoring, but there may be a written or unwritten policy that covers it. If you’re still losing sleep over this, we present a few ideas that should appeal to range of people including the mildly concerned and the truly paranoid. Oh and we’re not responsible if your attempts at subverting Big Brother land you a very private, but very unemployed life. You’re feeling overwhelmed. Despite your best efforts, your to-do list is growing a lot faster than it’s shrinking. You realize that the stress at your job has begun to impact your relationships, your concentration, and your health. Sound familiar? Well you may have more control over the situation than you think. The adrenaline rush you feel at stressful times is commonly known as the “fight or flight” response. This heightened state was important for our distant ancestors when faced with the dangers of their environment. A number of things happen, but the end result is that your body diverts energy away from non-essential things (such as digestion) and prepares for physical strain. Your heart rate and blood pressure shoot up and your senses become sharper. This allowed early humans to attack better, run quicker, and jump higher – all important things for keeping them alive. Unfortunately for you, these skills won’t get you very far when faced with a problem at the office. Coming out of college, many believe they have to abandon their wild past and join the workforce as responsible employees. They’re often surprised to find that there are just as many crazy young professionals, but with one important difference – they have the disposable income to do it right. For those of you working in sales or P.R., a little reckless socializing might come with the job. But for the rest of us, it can be a challenge to find the right balance between having a good time and keeping your job. Anyone can go crazy on the weekend, but it takes some skill to stay out until 4 am on a random Wednesday and do anything useful the next morning. There’s nothing worse than having every other person ask, “Late one last night?” So how can you truly work and play hard? You’ve heard it a million times: First impressions are important. It’s human nature to make assumptions about unfamiliar people. In other words, people tend to sleep a little easier when they’ve decided exactly what ‘type’ of person you are. But the first few weeks of a new job are about more than simply impressing your boss and colleagues. How you spend your days now will set the stage for the rest of your time at this company. Remember that each workplace has a unique culture that will take some getting used to. You may have mastered the game at your old position, but different rules apply at a new job. Texture photo flavour from urban dirty.